Dexter Allen was born in Crystal Springs, Mississippi (home of legendary bluesman Tommy Johnson). He has been playing guitar since he was 10, playing bass in his dad�s gospel band at the age of 12, and eventually branching out to play for other gospel groups in the area. He later toured all over the world with Bobby Rush, holding down lead guitar duties for three years before forming his own band, releasing two albums, and winning Male Vocalist of the Year honors in the 2008 Jackson Music Awards. For Allen�s third release, Bluez Of My Soul, released on Rush�s own Deep Rush Records, the singer/guitarist turns in a stellar 11 song set of modern urban blues and soul-blues in a style very similar to his musical mentor. The driving R&B of �Have A Time� will get you on your feet, and while you�re there, you might as well stay there for the infectious shuffle, �Bluez Party.� �Deep Inside� is an outstanding slow blues with stinging lead guitar from Allen. �Pudding & Rice� and �I Doubt It� are both prime examples of catchy R&B with some sharply witty lyrics. The closing track, �The Same Thing,� is a funky descendent of the old Willie Dixon tune of the same title. 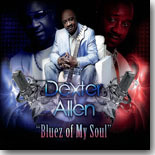 Dexter Allen�s Bluez Of My Soul is an irresistible mix of blues, soul, and funk from yet another talented bluesman from Mississippi --- living proof that the State of the Blues in the Magnolia State continues to be bedrock solid, and should be for years to come. It's refreshing to see the elder statesman of the Blues encouraging the development of those who follow. Such is the case of one Dexter Allen, and the lessons learned are more than apparent on his latest release on Deep South Records, Bluez of My Soul. Dexter was the lead guitarist in Bobby Rush's band for three years and the lessons learned from the master are all over Dexter's latest release. Let's give it a spin. We start out with the country-tinged "Coming Home to Mississippi," and Mississippi is indeed Dexter's home. "Ain't nothing like coming home...to Mississippi...cotton and catfish." He got me with catfish and Dexter's appreciation for his home state is strong. He's been all around the world but Mississippi is "home." Up next is "Ride the Train" and Bobby makes a spoken word appearance as the conductor of the train. "Dexter...are you getting on this train or not...we're going to a gig, baby...get your guitar and get on." "Girl...you look so good...I want to jump and shout...if you want to be free...girl, come on and ride this train with me." Dexter's working it hard and he's doing his best to win the attentions of the girl in question. Bobby's blowing his harp in the background and I'm still not sure she's getting on the train, but time will tell. Dexter's guitar is at the forefront of our next cut, "Still Called the Bluez," and I love the soulfulness of this tune. "Sometimes bad...and sometimes good...things don't work out the way they should...but just hold on...and don't give in...the darkest hour...is just before day...just keep going...you'll make it anyway." Perseverance is the lesson here and you just have to keep at it to win the day. I don't even know where to begin to describe our next tune, "Monk Donkey." Definitely funky. "If you want to hear me play...and play it real funky...let me see you shake your Monk Donkey." I think I'm just going to leave it at that. We move on to a slower-paced ballad, "Come Out and Play," and Dexter is professing his love to the object of his affections. "Well, girl I hope you feel the same way...the way that I feel for you...girl, I know it's getting late...and I can't hardly wait...but if you don't want to come out and play with me...I'll play with myself." Dexter definitely is in love with this girl and hopefully for his sake, she'll come out and play. Our tempo picks up and Dexter is definitely in a party mood on our next cut, "Have a Time." "We're going to have a time...going to have a good time, y'all." I'm loving his fretwork on this tune and it's feel good vibe is infectious. This theme of celebration continues as we listen to our next cut, "Bluez Party." "We're going to party like we're crazy...to the break of dawn...we don't need no DJ..just let the band go...we're going to shake it up and down..until you're hips hit the doggone floor." I think that about covers it and Dexter and his band are happy to provide the entertainment for this "Bluez Party." Joey Robinson's keyboard work highlights the subtext of Dexter's love for his woman as we advance to "Deep Inside." A beautiful ballad, Dexter is truly in love with his woman. "I really...really...want you to know...that having you in my life...has made a change...a change in me." She's been good for Dexter and he's happy to be the man she needs in her life. Dexter's player side makes its appearance on the next cut, "Pudding & Rice." Dexter's playing a dangerous game and I'm not sure comparing the loving of one woman to another is the smart thing to do. "I want to tell you something...you might think it ain't nice...your pudding ain't as good as her rice." Dexter's trying to let her down easy in the event he has to come back around someday and he's doing a nice job of that. Whether number two believes him or not is another matter. I like the funky feel of the next tune, "I Doubt It," and appreciate the keyboard work of Joey again. "Will you be that girl...that satisfies my world...I doubt it...will you be that girl...that sets my soul free...I doubt it." Dexter's not convinced this love is going to work and he's right to express his doubts upfront and move on from this girl. Our last tune on the disc, "That Same Thang," starts out with a Barry White deep bass feel and then Dexter moves on in to express his thoughts. "That same thang...that makes the birds and the bees get along...in harmony...some men act so strange...but everyone knows about...that same thang." Dexter at least is honest enough on this tune to admit what he's after, "that same thang that make a hog hug a hound, got me getting down...that same thang." I love the innuendo and I've known Bobby Rush long enough to know where Dexter got his silver tongue from. Bluez for My Soul is Dexter's first release for Bobby's Deep South Records, and its easy for me to see why Bobby has chosen to mentor Dexter by signing him to his label. Dexter's got his own sense of style with just enough funk to remind me of Bobby in his heyday and I'm already looking forward to his next release to see what's next. In the meantime, Dexter's paying his dues and building a following in Mississippi, and he played the prestigious Chicago Blues Festival this year. His touring schedule and this disc can be found on dexterallen.com, and I firmly believe the best is yet to come from this Mississippi Bluesman.